Sheep skins are from a thrift store. I was going to get the ones from Ikea, but then found these and I think I paid $22 for both. Score. They're so stinkin' soft and such a treat for our feet! My nightstand I found at a thrift store probably about a year ago for $25. I love the marble topped table and love that we have different nightstands to break up the look a bit. These two work great together since they're the same height. The matching lamps I found at another thrift store. Mitch and I were driving by one day and I saw these blingy lamps in the window. I went back the next day and bought them. I adore these vintage lamps! Inside the glass ball is a nightlight that I turn on every evening. I love how the ball glows and glistens. The blanket chest was a gift from my parents for my 16th (I think) birthday. We called it a hope chest and I filled it with things that I collected for my "one day" house. It was the perfect gift for this decorating-lovin' girl. At one time, I had boxes of dishes stashed away in there and other little trinkets I picked up. But the top of the chest had been all scratched up. I could have refinished it, but who has time for that? So I slapped some paint on that puppy and now she's sportin' a whole new look. Chairs we already had. Actually ripped them out of the living room to stick in here. I needed some additional seating in here since we had this huge space of nothingness. This is the area that took the longest for me to figure out. Actually it wasn't until this area was done that I felt confident sharing this space with you guys. 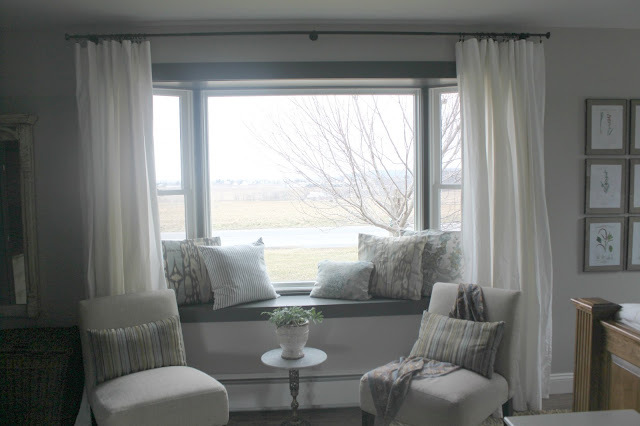 I even emailed Joan from For the Love of a House to get her opinion (and she gave a thumbs up to the window seat idea). A handmade basket functions as our hamper. I love the quirky crookedness of it. Picked it up for $5 at a thrift store. The Audubon print was a Christmas gift from Mitch. And the one under that is an antique watercolor. (sorry about the glare) The chair I picked up for a couple bucks at an auction. And the white lamp was a thrift store find. I paired it with a red lampshade that I got at a yard sale. Is that it? I think...maybe?? I'll show you guys the inside of our wardrobes another time. If you have any questions, feel free to ask in a comment. Someone did ask where the barn door leads to...the MASTER BATH!! Guys, I'm really excited to show you that space. We have some odd and end things to tie up, then I'll have that reveal. thanks for sharing how you finsihed your room. I seriously love it. What is your go to thrift store? Well Goodwill is up there on the list, but also local thrift shops. I haven't met a thrift store I haven't liked! I LUV the grouping of Botanicals, and any man must feel right at home with the duck print. I think you've done a stellar job of ying & yang. Your bedroom is beautiful! When can I move in? I'm your newest follower, found you at TT&J. I think your furniture is really pretty and classic. It is hard to acheive that without antiques which I am sure your furniture will one day become. When I was in college I worked at a furniture store. It was a lot of fun and I'll never forget that new furniture smell. Craig's List find! Where would we be without CL? Beds with precious stone pads and gold-plated tables, I'm certain you know these bedrooms from TV. In the event that each main bedroom required these extravagance components, nobody could have such master bedrooms. So what really isolates a master room from alternate bedrooms? It’s great information for the pof shrink film manufacturers as well as consumers. What thickness of shrink films o be used for which products and every shrink film requires different thickness. Great information to add to my knowledge. I am a cat lover and loves this lunch box with cute cats on its front and back. I m also looking for a Cat Pillow Case and everything that has this cute little pet on it. Allergies can be of diverse nature. Eczema is a kid of allergy caused by various reasons. Treatments of allergies are also diverse. Mild eczema can be easily treated by using lotion for eczema and creams. Investments in equity funds prove to be the best in the long term and considered safe by the fund managers. Alcohol, Drugs and emotional stress are the psoriasis Causes. Buy the latest Diamond painting cross stitch. We offers the best Diamond painting cross stitch products online shopping. It’s great information for the pof shrink film suppliers as well as consumers. What thickness of shrink films o be used for which products and every shrink film requires different thickness. Great information to add to my knowledge. Australian equities have shown a remarkable bull market owing to a central bank policy of maximum liquidity and a corporate policy of maximum profits. Australian fund managers are ditching the traditional buy-hold strategy and instead looking for trading opportunities as a way to deal with the actions of central banks and gyrations in offshore markets. Tea tree oil and Rosemary oil are the best Eczema Oil. Painting with diamonds is an easy and enjoyable activity for craftrs young and old. Based on the same concept as mosaics and paint-by-numbers. PET bottles made of polyethylene terephthalate can be used to make lower grade products, such as carpets. Are you looking for the best PET bottle manufacturers in Bangalore? investments in equity funds prove to be the best in the long term and considered safe by the fund managers Australia. Buy Eczema relief oil online is available on Rekonstrux. Do you know what is diamond Painting? Diamond Painting is an easy and enjoyable activity for crafters young and old. Everyone must try it. I personally love it to the fullest. Mulching in agriculture holds great importance. Your blog is a great read for all the farmers and people at large who are involved in gardening and farming. The information regarding use of mulch films in your blog will benefit all. In the past few months, I’ve been spending a good deal of time researching and getting to know the safe and secure scheme for long term investments and found out that passive investment strategies are best for long-term investing and dug out some best investment funds Australia. light therapy. There is a lot of info on Internet about how long eczema lasts? Psoriasis treatment aims to remove scales and stop skin cells from growing so quickly. Topical ointments, light therapy and medication can offer relief. Color Relaxation provides paint by numbers adults and teenagers. We have 100's of paintings to choose from. There are various Eczema relief oil & gel are available in the online market. There are best eczema oil for eczema available in the market that are used differently. These oils relieve the itching and inflammation to a great extent. Painting with diamonds is an easy and enjoyable activity for crafters young and old. Based on the same concept as mosaics and paint-by-numbers. If you are looking for effective Keto Shakes Recipes For Weight Loss, you can read that on health pro blog. They are very beneficial for losing weight. You must try these shakes. If you are looking for Indian Dinner Recipes For Weight Loss, then you must check health pro blog. You can find a lot of healthy weight loss recipes on the blog to lose weight in an effective way. I enjoyed all of the details you have shared above but I am looking for mandala meaning. do you help me with this? All of the pictures you have shared above are perfect for every bedroom & I like to have all this in my room very happily. Do you know about Dreamr platform? I am looking forward to re-arrange my room and ideas I got from your blog are really helpful. Thanks for sharing this helpful information. You shared useful information. You had done really hard work for this post and also for your room. Your work is appreciable. Hear about diamond tiger art?